So I was cleaning out the freezer, getting ready for Passover, and rediscovered a forgotten container of leftover soup chicken. Ooh! Perfect for a casserole or tacos or something equally exotic. So I tossed it into the fridge to defrost, and to give me time to figure out what exactly to do with it. A few days later Pi Day happened. 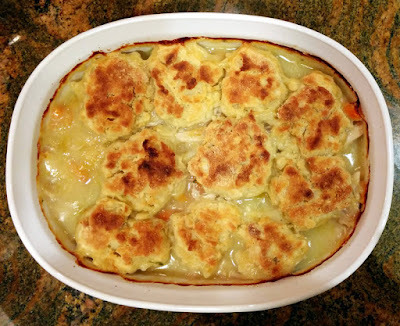 And since there is no rule that pies have to be sweet, a savory Chicken Pot Pie would be perfectamente! Except for one slight problem: I'm terrible at making tender, flaky crusts. So I instead topped the filling with drop biscuits instead. No rolling, no cutting, just a little scooping. 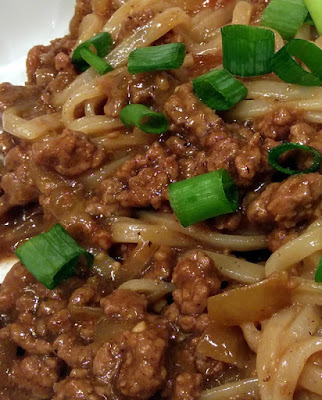 Totally easy and very delicious! Even crust-haters ask for seconds. A few friends and some Dear Readers have mentioned giving up meat, either temporarily for religious purposes or for a myriad of reasons long-term. So to help them a little, I am sharing this amazing, easy to make meat-free pasta dish. Chock full of olives and herbs and kissed with a bit of lemon two ways, theHubs says it's amazing as is. But I prefer the addition of Parm cheese to jazz it up dairy-style. 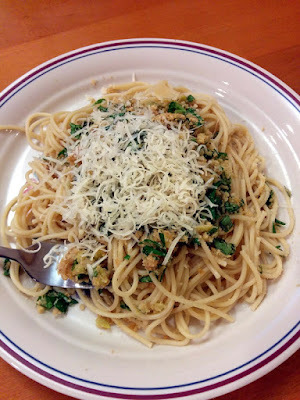 Either way, this weeknight olive sauce is so easy to make, you will have to wait for the pasta to finish before you can finish off the sauce. So I'm leafing through the print version of Hadassah Magazine when I happen upon a Brussels sprouts recipe that stops me cold. Literally. Jazzed up and served as a salad, but raw. Raw? 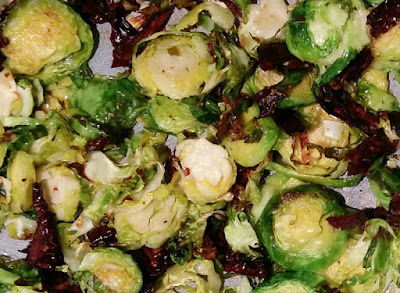 Aren't Brussels sprouts disgusting enough cooked? 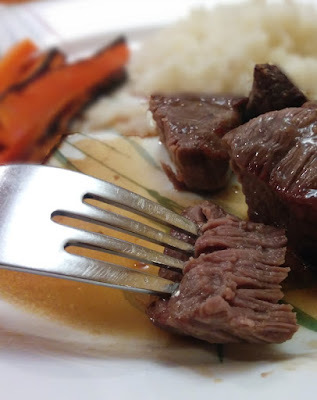 But the ingredients, plus most of the directions, had the potential for major improvement. I knew I was on to something after tinkering with both ... something that even haters will enjoy. Like the taste of pomegranate, but hate messing with all those seeds? Then get ready to be wowed: tender cubes of beef, drizzled with a honey-kissed pomegranate sauce ... with nary an aril in sight! 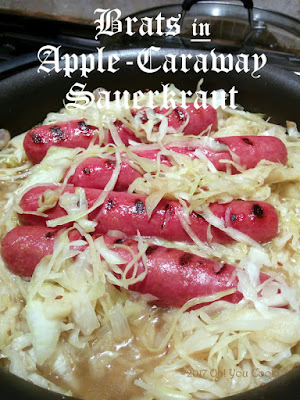 What if I told you that making your own sauerkraut was mad easy? What if I told you that it only has two ingredients ... and that neither is vinegar? I know what you'd say: um ... you already told us all that yesterday. Cabbage. And salt. Okay then ... besides that? Oh, this is so exciting, that I'll tell you now. But before I do, to add just a touch of suspense, let me mention that you don't need any fancy-schmancy equipment. 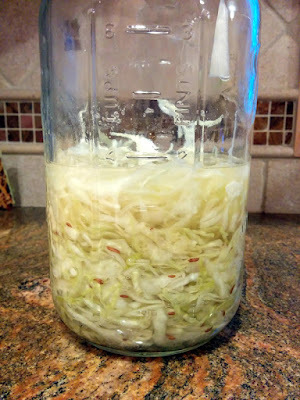 No need to sterilize jars or covers, or boil the life out of the cabbage to get rid of bacteria. Because THAT'S the real secret ingredient ... bacteria. Now stop with the ewwwww. Especially if you (by now) peeked at yesterday's post. Because probiotics, in a ton of superfoods that you love and enjoy, are simply bacteria. Just the good kind. The kind that makes a fermented food a superfood. And cures everything from cancer to ingrown toenails, if you believe all the hype anyway.